I'm not on Twitter, so the world is sadly deprived of my wit. But judging by how long it took me to come up with just those three fake tweets, it would behoove me to stick to what I know. 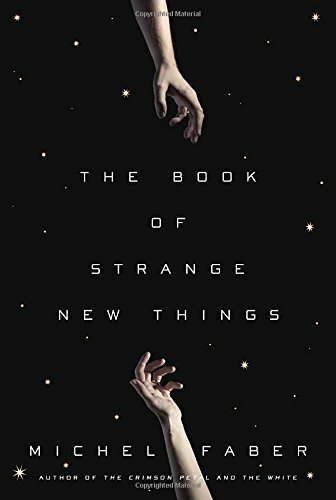 So in a few more words, here's what I can tell you about The Book of Strange New Things. It's an odd combination of ideas, with sci-fi and religious elements promiscuously commingling. It's also a study in gorgeous prose, with a fascinating chapter-naming convention—the title of each chapter is taken from its final sentence. I found myself trying to guess which character might have spoken the words and what the context might be by the time I reached the chapter's end. As someone who normally barely glances at chapter and section titles, I was tickled by Faber's attention to an oft-ignored, minor detail and found the foreshadowing enhanced the reading experience. Faber's protagonist, Peter, is a British pastor chosen by a secretive corporation to travel billions of miles away from Earth and minister to an alien race. He leaves behind a loving wife, Bea, a well-functioning church, and what we quickly learn is a planet on the brink of disaster. Peter and Bea expect the separation to be difficult, but they are woefully unprepared for the trials ahead. As Peter is trying to settle into the foreign environment and get acquainted with his new flock, Bea's missives become erratic and despairing. At first Peter is too distracted to muster up much concern about what's going wrong back on Earth, but soon the tragedies aren't only in the news, they're personal. Bea is falling apart, and so is their marriage. Peter is an interesting but enigmatic character, and I found myself struggling at times to make sense of his choices and motivations. His new planet and its placid inhabitants seem to have a disorienting effect on him, one that I couldn't always parse. However, his adventures are so unlike anything I've ever read, and Faber's prose is so shimmery smooth, it more than made up for any false notes I detected in Peter himself. So as one might say on Twitter, “Calling all Christian sci-fi fans of literary fiction about relationship drama! Hello? Is this thing on?” This book, despite its unusual mixture of topics and themes, is destined to find a wider audience than its categorization should allow.